My wife came up with this wonderful bar cookie recipe. We made it to take to a holiday party at my work and saved the ones above for the kids to take over to my grandfather. He loved them! Pre-heat oven to 350 degrees. Put butter and/or coconut oil in 9x13 pan and put in oven to melt. Set timer for 5 minutes or watch carefully so it's just melted. Toast the oats and pecans in a heavy skillet over low heat. Stir constantly until the oats start to brown and the nuts smell toasted. Take off heat. Stir in the shelled hemp seed and let cool. Put the brown sugar in a medium sized mixing bowl, pour the melted butter over it, and beat to mix. Add eggs and beat. Add extracts. Mix in flour, baking powder and salt. 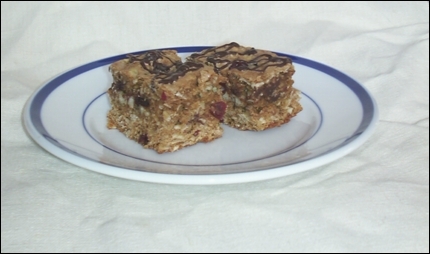 When combined add oat & nut mixture, stir until combined then fold in chocolate chips and dried fruit. Spread evenly into 9x13 pan. Bake for 35-45 minutes, or until toothpick comes out clean. Cool and cut into squares. If you want you can drizzle melted chocolate chips over the tops of the finished bars. Notes: This was originally made with pre-made granola, but it's just as easy to make it completely from scratch (and leaves the granola for snacking).